Overpowering SNOWMAN and SNOWMEOW, the LUNA-TAKS gain entrance to an old Thundrillium mine on Hook Mountain. 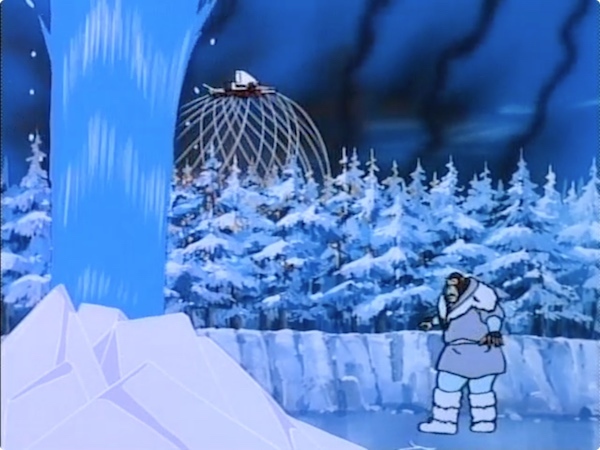 During the battle with SNOWMAN, the LUNA-TAKS cause a forest fire which SNOWMAN attempts to extinguish, while SNOWMEOW seeks the ThunderCats’ help. 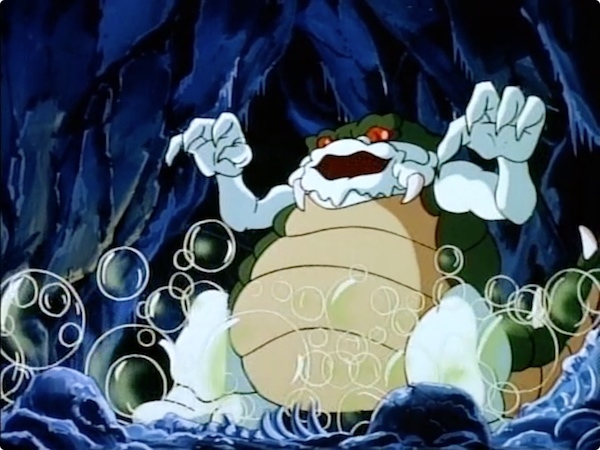 Inside the mine, THE MAD BUBBLER, a reptilian creature of pure evil, entrances the LUNA-TAKS resulting in them becoming more evil than they were originally. They attack one another; CHILLA attacks LUNA and AMOK and then flees to spread havoc around Third Earth. SNOWMEOW reaches the ThunderCats who take the Feliner to Hook Mountain and extinguish the fire. However, the fire caused the mountain’s snow to melt and SNOWMAN is carried away in a flood. 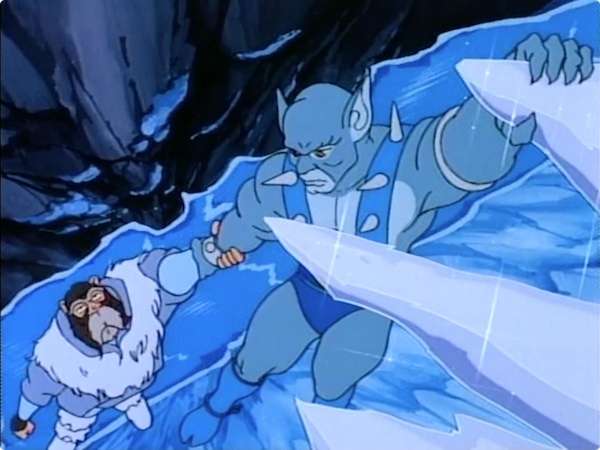 PANTHRO attempts to rescue SNOWMAN from a swirling basin but fails. Just as they are both about to plunge over the mountain’s side to their doom, the ThunderCats rescue them with the Feliner. 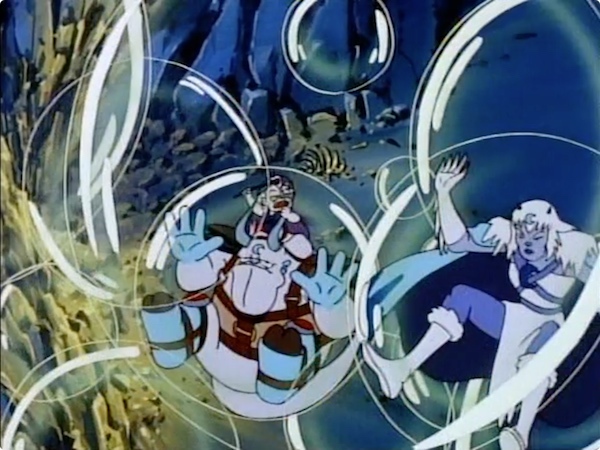 While battling the LUNA-TAKS in the mine, the ThunderCats are entranced by THE MAD BUBBLER. They turn evil and try to destroy one another. The Sword alerts LION-O to the ThunderCats’ dilemma and he rushes to Hook Mountain. En route, a BERBIL informs him of the legend of the mine: Whoever enters will be destroyed by the evil in his own heart. 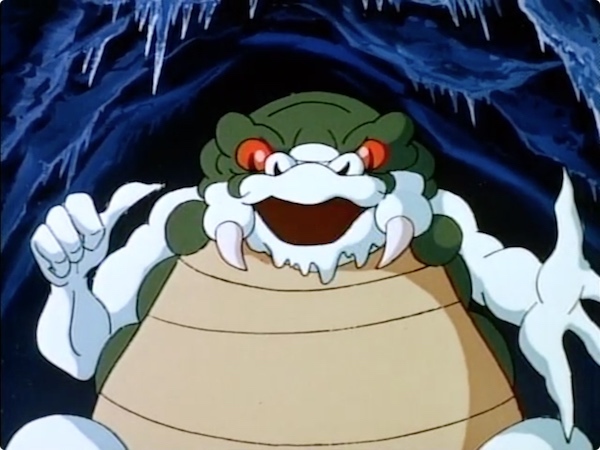 On the mountain, SNOWMAN begins to dissuade LION-O from entering the mine, when JAGA appears and tells LION-O that SNARFS do not possess any evil at all and therefore they are immune to THE MAD BUBBLER’s powers. LION-O summons SNARF and SNARFER to the mine where they succeed in provoking the entranced ThunderCats to chase them out of the mine. 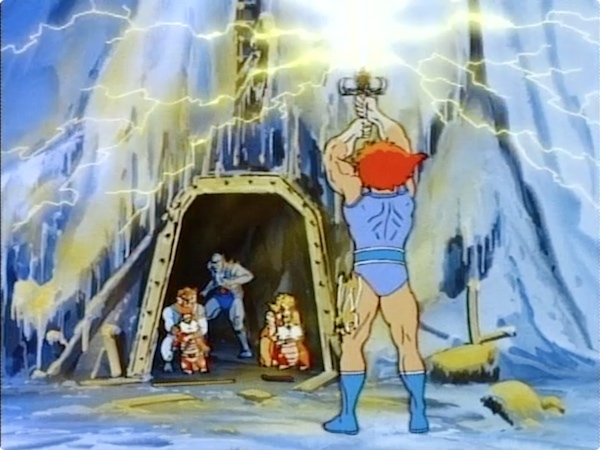 An awaiting LION-O uses the Sword’s powers to project a beam around the ThunderCats, thus breaking the BUBBLER’s spell. The Luna-Taks ignore a superstition and warnings from Snowman about entry into a thundrillium mine on Hook Mountain. The caution and superstition prove to be well-founded, as the Luna-Taks find out, when they encounter the Mad Bubbler, who lives in the mine. This creature exudes a gas which causes all who inhale it to be overcome by their own bad impulses while in the mine. Restraints are undone, and individuals under the Bubbler’s spell feel they must destroy or be destroyed. 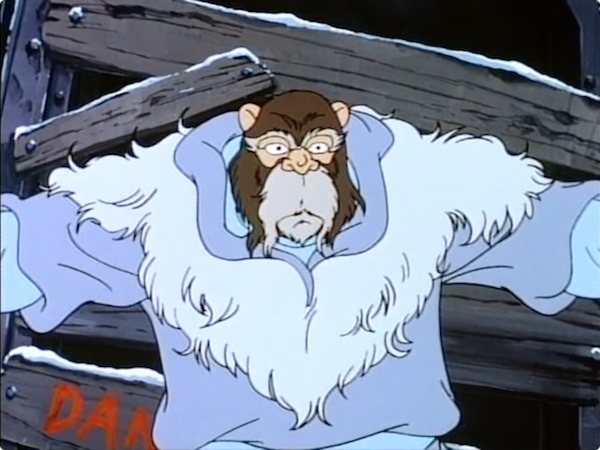 When Panthro, Cheetara, and Tygra also ignore Snowman’s warning and enter the mine to prevent the Luna-Taks from stealing thundrillium, they too fall under the spell. 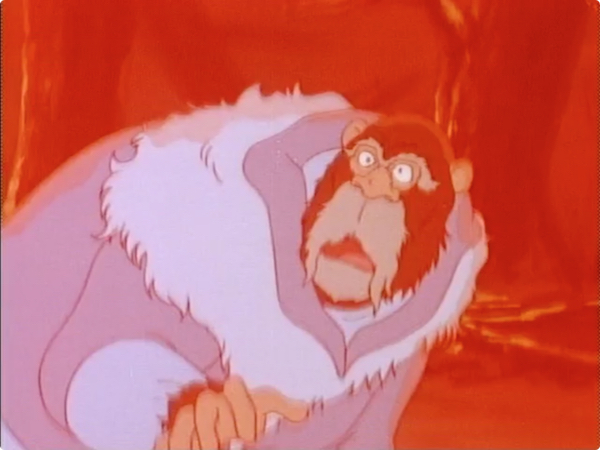 Upon discovering what has happened, Lion-O at first does not believe what he learns from Ro-Bear-Bill, that those who enter the mine are destroyed by the evil in their own hearts. But Jaga confirms this in instructing Lion-O about the capacity for good and evil that exists in every creature except the species of Snarf. 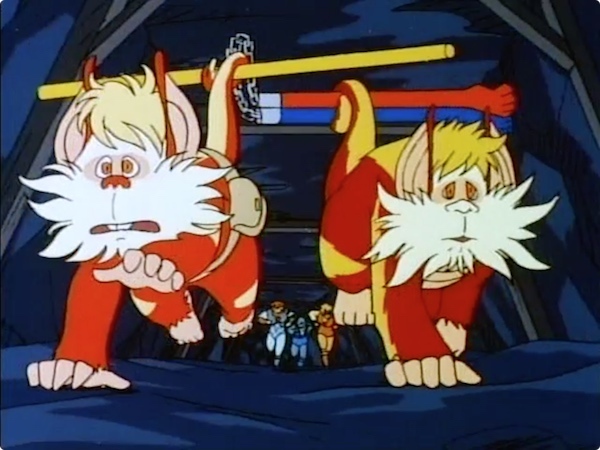 Using what has has learned, Lion-O sends Snarf and Snarfer into the mine where, unaffected by the Bubbler’s gas, they are able to lead the ThunderCats out of the mine and back to normality. Lion-O and the ThunderCats learn a lesson about human nature that applies to all of us. Each of us carries within ourselves the capacity for doing right and wrong. If we deny we have the potential to do wrong we fool ourselves and often commit a greater wrong in thinking we are different. When we make fun of others or bully them, we do it because we think we are superior to them, as if we are incapable of doing the same thing. Being good does not mean we are incapable of doing wrong. It means we freely choose to do right rather than wrong. It means we recognize our common humanity with others and the moral choices we make. Who are you, really? In “The Mad Bubbler”, Kimberly Morris offers an answer, devising a villain who distills all his victims down to their basest and most wicked impulses. It’s an interesting premise on the surface, and the Mad Bubbler himself—LJN-inspired or not—is an entertaining fellow; but Morris’s effort is awkward overall, and her snarfy solution is a far-fetched deus ex machina that could have been so much better. Worst of all, the best moments have nothing to do with the Bubbler at all. The episode’s setup is intriguing and leads to an immediate conflict. Disregarding Snowman’s words of caution, Snowmeow wanders into a thundrillium mine on Hook Mountain from which no one has ever escaped. Meanwhile, Luna decides to take advantage of the mine’s superstition in order to become a thundrillium mogul. The resulting confrontation is a fascinating character study and is easily the episode’s best scene. Snowman and the Lunataks have never met and do not recognize each other. They don’t know one another’s allegiances and, all else being equal, have no inherent reason to exchange blows. What unfolds, then, is a pure expression of their true colors. Snowman bars the Lunataks from entering the mine for their own well-being, and Luna orders Chilla to attack him. Snowman blocks their way with an ice barricade, declaring that he is concerned for their safety even if they aren’t. Chilla responds by trying to burn him alive. If the big question of the episode really is, “Deep down, who are you?”, then we have our answer: Snowman is stubborn and gallant, and the female Lunataks are dismissive and horribly violent. Great stuff. What transpires inside the mine, though, is far less captivating. 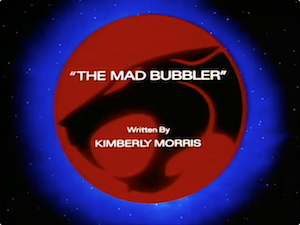 The Bubbler’s Mine Madness compels the Lunataks, and later the ThunderCats, to express only their most vile and violent instincts: destroy or be destroyed. As Jaga explains to an incredulous Lion-O, everyone is born with the capacity for good and evil and consciously chooses one or the other. Force the evil choice, and we’ll all just destroy each other. The solution, we learn, is that snarfs have no such choice—they are mindless slaves who can only do good. 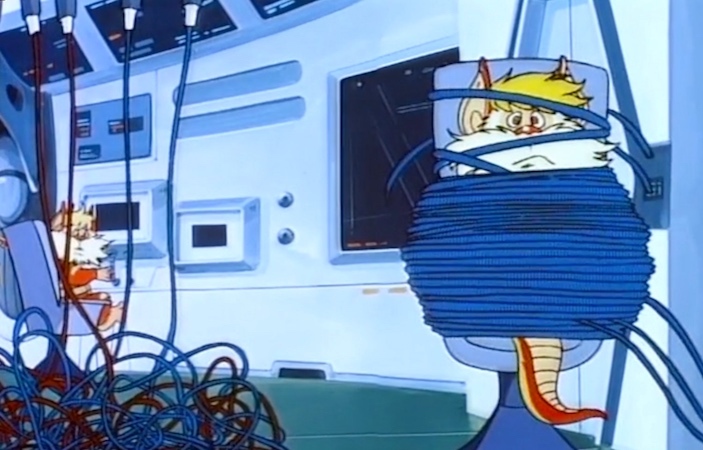 Setting aside all the evidence we have of Snarf and Snarfer acting dishonestly, this solution is ham-handed. Imagine instead if Mine Madness were more like truth serum on steroids, escalating petty bickering among friends into all-out combat, yet resolvable by the warm fuzzies of magnified friendship. What could have been a dramatization of our characters’ true colors, foreshadowed by Snowman vs. Chilla, is instead treated as a black-or-white conflict driven by a complete lack of volition. Oh well. Production-wise, “The Mad Bubbler” is all over the place. Much of the animation is sub-par, and two moments—Snowmeow jumping back and forth across the Bottomless Chasm and Luna crying for help after escaping the ice barricade—suggest a disconnect between script and art direction. 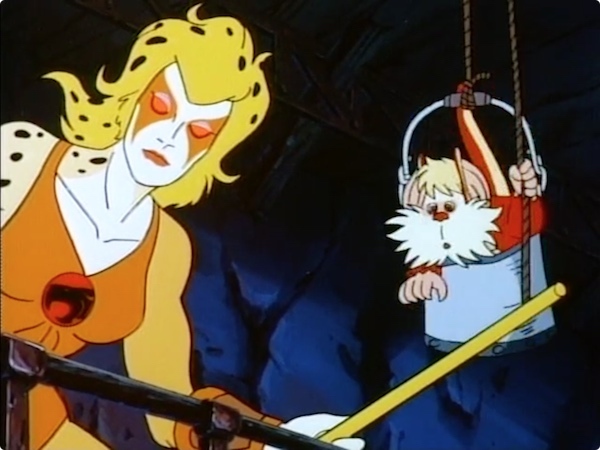 There are some highlights, though, including a striking special effects shot of Snowman in the burning forest, Snarf subconsciously using his tail as a third hand, and a quick shot of Snowmeow peeking out the window when Cheetara says, “Look down there!” The Feliner rescue sequence is especially well done, providing a memorable thrill that the action inside the mine fails to deliver. The mine sequences aren’t all bad. The mine itself, strewn with skeletons and derelict equipment, is suitably creepy; and Bob McFadden’s Bubbler is a hoot. Like an underwater cross between S-S-Slithe and Scrape who’s having the best day ever, he’ll chortle and gurgle his way through dull exposition and into your heart. “What’d he say?” asks Snarf. “Beats me, Uncle,” Snarfer replies. “Some character, huh?” Indeed. In the end, though, the action in the mine is largely overshadowed by the tension in the episode’s earlier moments, and the lesson in human nature has more to do with arrogance than with choices defining one’s character. 1 ^ Because he can’t read, he also misses the big sign that says, “DANGER KEEP OUT”. 2 ^ The tunnel that the Lunataks conveniently escape through suggests that there have been some near successes. 3 ^ Luna’s goal is odd. Control the thundrillium supply and become a kingpin? Why? 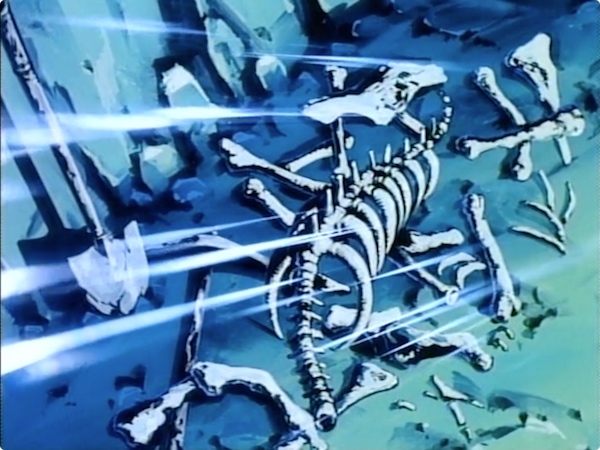 The ThunderCats already have their own supply, and this mine isn’t even a part of it. 4 ^ Lion-O seems insulted by the suggestion that ThunderCats might be capable of evil. Um… Grune? 6 ^ Freezing the river with Snowman and Panthro still in the water could have ended very differently. Lion-O travels to the Berbil Village to deliver seedlings, indicating that the ThunderCats are experimenting with growing food. Chilla demonstrates more advanced fire powers here, both in setting the forest ablaze and in fashioning grenades. Snowmeow can communicate telepathically with Cheetara. It could be a feline thing or a sign of Cheetara’s growing abilities, as in “Touch of Amortus”. The Feliner is full of water and ready to go. Perhaps the Cats have become Third Earth’s firefighters! Lion-O asks for RoBear Bill’s help in getting to Hook Mountain. Berbilmobile? LJN’s unproduced Mad Bubbler action figure inspired the eponymous character’s appearance and bubble-making, but Morris deserves credit for giving him life.